NEW YORK (June 4, 2015)— Intermarché and Chipotle Mexican Grill were the top winners of the inaugural Positive Change Effie Awards, presented at the Effie Awards Gala in New York. The Positive Change Effie Award honors brands that shift consumer behavior towards environmentally sustainable choices. * The award is a collaboration between the World Economic Forum and Effie Worldwide. In the inaugural year, there were two categories – Positive Change Europe and North America. • Intermarché and Marcel won Gold for “Inglorious Fruits and Vegetables” in France, which positively repositioned imperfect fruits and vegetables to reduce food waste. • Chipotle Mexican Grill and CAA Marketing won Gold for “The Scarecrow” for the United States, which generated a conversation about the state of processed food and its effect on our world. • Kimberly-Clark and TRISECT won a Bronze Positive Change Effie for Scott Naturals Tube-Free’s “Toss the Tube” launch, aiming to eliminate the substantial amount of toilet paper tubes that are thrown away each year. • Greenpeace and The VIA Agency won a Bronze Positive Change Effie for “Clean Our Cloud,” a campaign that raised the issue of how the decisions we make as consumers are having a negative impact on the environment. Keith Weed, Chief Marketing and Communications Officer of Unilever, served as Global Chairman of this year’s Positive Change Effie program, selecting and leading juries of esteemed marketers from across North America and Europe. Jury members included executives from The Coca-Cola Company, Edelman, JWT Canada, Mars, Nike, Ogilvy & Mather, Patagonia, R/GA and Seventh Generation. The full winner's list for the 2015 Positive Change Effie Awards, as well as a complete list of jurors, can be found here. 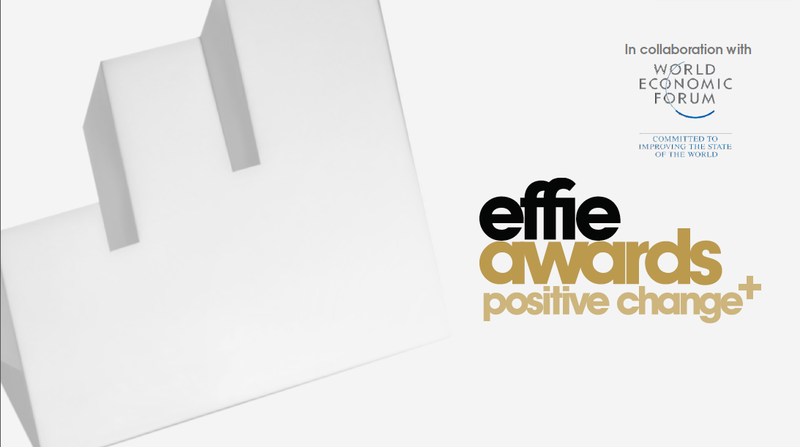 Entries into the 2015 Positive Change Effie competition needed to run in the marketplace between September 1, 2012 and October 31, 2014 in Europe or North America.